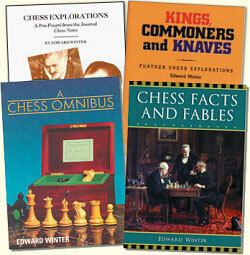 1/13/2008 – This further selection from Chess Notes includes a neglected game which Lasker reportedly nominated as his deepest, a discussion of the short-lived American player George H. Derrickson, discrepancies in a Colle v Grünfeld game, and the still-unresolved affair of the termination of the 1984-85 Karpov v Kasparov match. Readers are invited to join in the hunt for clues. Where did Alapin give such advice? The quote, incidentally, is on page 13 of the French translation, Cours scientifique d’échecs (Paris, 1998). 22...e5 23 h3 Nxe3 24 Rxe3 exd4 25 Nxd4 Bxc5 26 Qb2 Qf6 27 Rd1 Rd8 28 Bf2 Bxd4 29 Rxd4 Qxd4 30 Qxb7 Rab8 31 Qa6 Qd6 32 Qxa5 Qxf4 33 g3 Qg5 34 Rxe4 Qf6 35 Rf4 Rd1+ 36 Kh2 Qc6 37 g4 Qh1+ 38 White resigns. Where did Lasker state that this game was his deepest, and has it ever been annotated in depth? Lasker himself offered some notes on pages 3-4 of his magazine the London Chess Fortnightly, 15 August 1892, but without any indication that he regarded the game as outstanding. 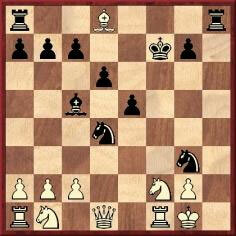 He described 22...e5 as ‘the winning move’ and broke off with an abrupt ‘And won’ after his 28th move. Clarification of this matter is still being sought. C.N. 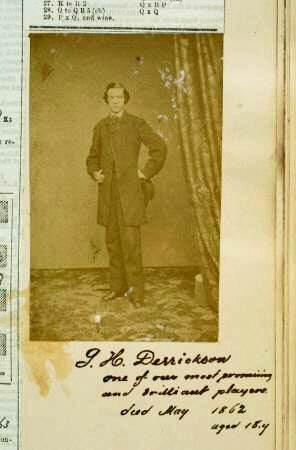 2103 discussed George H. Derrickson of Philadelphia, USA, who died on 16 April 1862 while still in his teens and whom several nineteenth-century sources referred to as a potential second Morphy. His only widely-published game is a brilliancy played in Philadelphia in 1860 against an amateur, who was identified (rightly or wrongly?) as J. Smith on pages 41-42 of America’s Chess Heritage by Walter Korn (New York, 1978): 1 e4 e5 2 Bc4 Nf6 3 Nf3 Nc6 4 O-O Bc5 5 d3 d6 6 Bg5 Bg4 7 h3 h5 8 hxg4 hxg4 9 Nh2 g3 10 Nf3 Ng4 11 Bxd8 Bxf2+ 12 Rxf2 gxf2+ 13 Kf1 Rh1+ 14 Ke2 Rxd1 15 Nfd2 Nd4+ 16 Kxd1 Ne3+ 17 Kc1 Ne2 mate. Richardson was described on page 73 of G.C. Reichhelm’s Chess in Philadelphia (Philadelphia, 1898) as ‘a remarkably brilliant player’, but relatively little has yet been discovered about him. 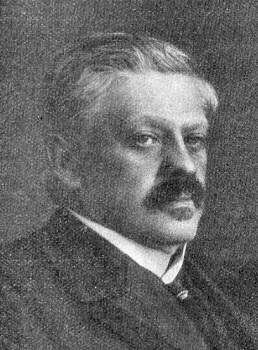 Stories about Steinitz, God, telephones, electricity, madness, etc. are, alas, a mainstay of popular chess writing, and it is difficult, if not impossible, to disentangle and appraise all the contradictory versions. 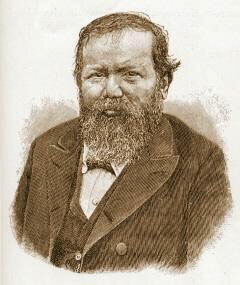 See our feature article Steinitz versus God. 13...Qxa2 14 Rxa2 bxa2 15 Na3 Nxa3 16 Qc1 Nb1 17 Bc2 a1(Q) 18 Bxb1 d6 19 O-O Nd7 20 White resigns. As noted on page 147 of Kings, Commoners and Knaves, the details provided are inconsistent, e.g. Stackpole v Kirkham, 1881 and B. Kirkham v G. Mackenzie, 1881. 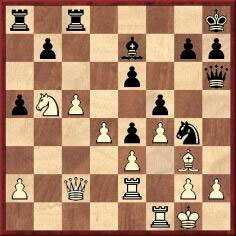 Is it really a nineteenth-century specimen of 1 d4 Nf6 2 Bg5 (Trompowsky’s Opening)? 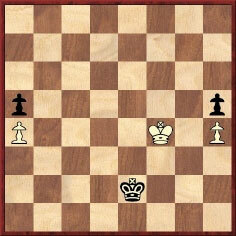 White, to move, announced mate. 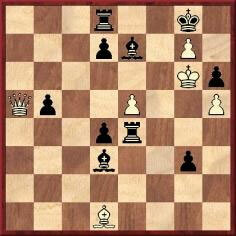 The position arose in a game played in 1874 in Dorpat (present-day name: Tartu) between unnamed opponents. 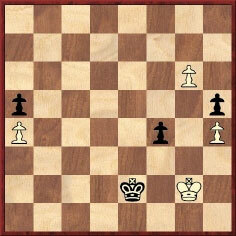 The forced mate is 1 Bb3+ Bc4 2 Bxc4+ d5 3 Qxd8+ Bxd8 4 Bxd5. 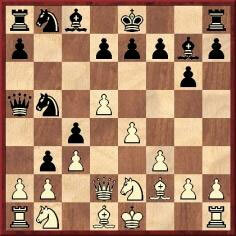 If 1…d5, White plays 2 Qxd8+ Bxd8 3 Bxd5 mate. 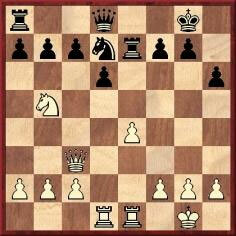 However, it is the third possibility which presents the table-turning tableau: 1 Bb3+ d5 2 exd6+ Re6 mate. Unfortunately the confusing German text in our source (Baltische Schachblätter, Heft 11, 1908, page 54) does not make it sufficiently clear how the game ended. The magazine credited the position to the Düna-Zeitung, but it remains to be discovered whether that publication had been more explicit. ‘In einer von F. Amelung notierten Endstellung, die einer in Dorpat im Jahre 1874 gespielten Partie entstammt, hatte Weiss seinem Gegner Schwarz das Mat angekündigt. Nach dem Zuge 1 Ld1-b3+ war Schwarz bei d7-d5 schon in 3 Zügen und bei Ld3-c4 in 4 Zügen matgesetzt. Zur Überraschung der Zuschauenden ergab sich aber, als die Partie von zwei Amateuren in der Diagrammstellung durchgeführt wurde, noch ein ganz anderes drittes Resultat. Weiss zog nämlich 1 Lb3+ und Schwarz antwortete darauf mit d7-d5. Als dann Weiss 2 exd6+ gezogen hatte, da folgte der Matzug – jetzt aber hatte Schwarz merkwürdigerweise matgesetzt. Tableau! Resignation in a drawn position? Colle’s notes did not mention that Grünfeld resigned in a drawn position. Was this an omission/oversight or did the drawing opportunity never arise because the game-score in the tournament book was faulty? We added that if White’s 72nd move had been Kg3, rather than the odd-looking Kh2, there would have been no draw for Grünfeld because after the exchange of queens the white king would reach f4 at move 76, and not move 77. One of the most notable mysteries and controversies is the conclusion of the 1984-85 Karpov-Kasparov world championship match. Our feature article, recently supplemented, has pointed out some of the misreporting (to employ an extreme euphemism) of the affair, but in the present item we approach the Termination from another angle: would it be possible to compile a bibliographical digest of the published statements of all the parties (players and officials) directly involved? Any such citations, and especially from little-known sources, will be much appreciated. The scope for collating, investigating and sifting evidence remains vast and, to reiterate our remark in C.N. 3328, it is to be hoped that, even now, an enterprising writer will be able to pull off the feat of obtaining from Campomanes his ‘definitive’ version of the events in Moscow. As matters currently stand, of course, no respectable chess writer can claim (or, we believe, has claimed) to know for sure what happened in Moscow in February 1985.